Eggs Benedict .... not something normally on the menu for those of us not eating gluten or dairy ... but this past weekend it was a craving of mine. I think I associate this Sunday-Brunch dish with S-P-R-I-N-G! I love any egg dish with fresh herbs! 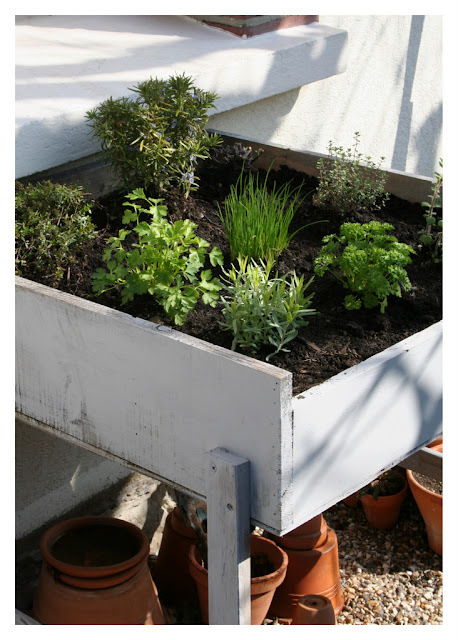 At the moment -- herbs are the only thing growing outside! I just re-planted my kitchen window herb table ... ready for snipping! It is also a dish that some reserve for ordering out because the concept of making 'Hollandaise' is daunting; visions of lumpy, curdled, or greasy off-white sauces come to mind. Also, you might assume that there is milk or cream in the sauce, there isn't, and as you will see, you can use a good quality dairy-free margarine instead of butter. 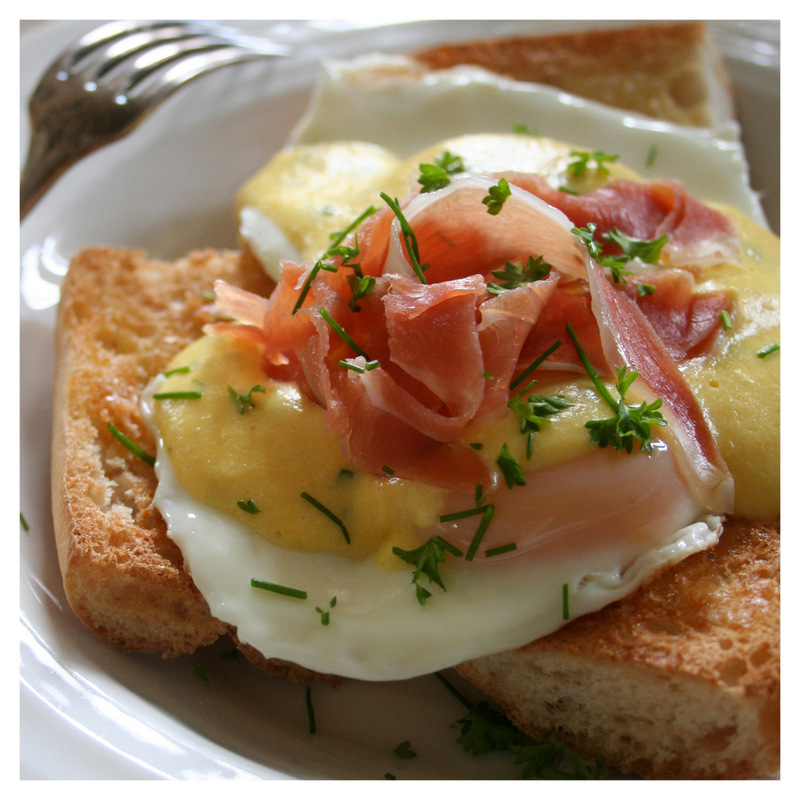 Gluten & Dairy-free Eggs Benedict with Jambon and Fresh Herbs. Melt the margarine in a small sauce pan. In a bowl, whisk egg yolks well. 'Temper' the yolks with a small drizzle of the melted margarine while whisking and then add the yolks to the rest of the melted margarine, while whisking. Don't worry if it gets lumpy -- but keep the heat low and add the lemon juice. Season with salt and I also added chopped chives this time. Hint -- if the sauce gets too thick or lumpy or 'breaks' add up to a tablespoon of hot water and whisk it smooth again. For bread -- if you can get gf muffins that's fabulous. I used a gluten-free baguette made by a company called 'Schaar'-- it is so good! Poach eggs to desired done-ness. Here is a link for perfect poaching if you need a few tips! Top 'buttered' toasted bread or muffins with poached eggs, sauce and 'Jambon' -- this time I had Jambon Bayonne found here in France, a thin smoked ham which is similar to Prosciutto. Fresh herbs add fresh garden flavor with the slightly tart lemony sauce! Really, the Hollandaise is the most 'difficult' part of this dish -- and see how easy it actually is? In the spring I also make it with fresh steamed asparagus and use smoked salmon or artichoke hearts too! 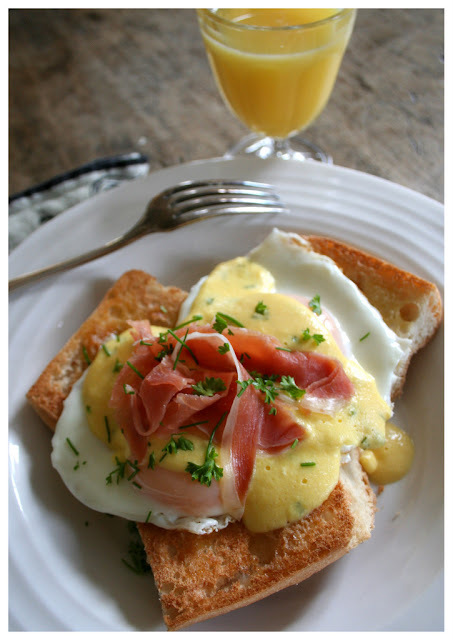 Perfect spring breakfast ... or Easter Brunch!